San Francisco residents depend on us for one thing: affordable eco-friendly decking. For years, we've shipped Ipe, Tigerwood, Cumaru & Garapa decking to homes throughout the SF Bay area. We also offer hardwood Decking Tiles. When you contact us via phone, or email, you can depend on first-rate, 100% natural / chemical free, premium grade decking that originated from our sustainable mills. Now's the to build a deck with hardwood decking as beautiful as San Francisco itself. Contact us today for premium quality, sustainable, genuine decking. 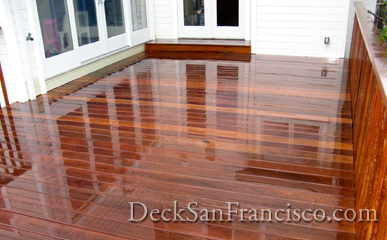 *DeckSanFrancisco.com currently ships hardwood decking to all areas in San Francisco. We are planning on opening a showroom in the coming months and are reviewing possible locations. If you have questions about getting Ipe, Cumaru, Tigerwood or Garapa decking shipped to your local jobsite, please contact us. You’ll find that our support staff is very knowledgeable and eager to help. © DeckSanFrancisco.com, All rights reserved.